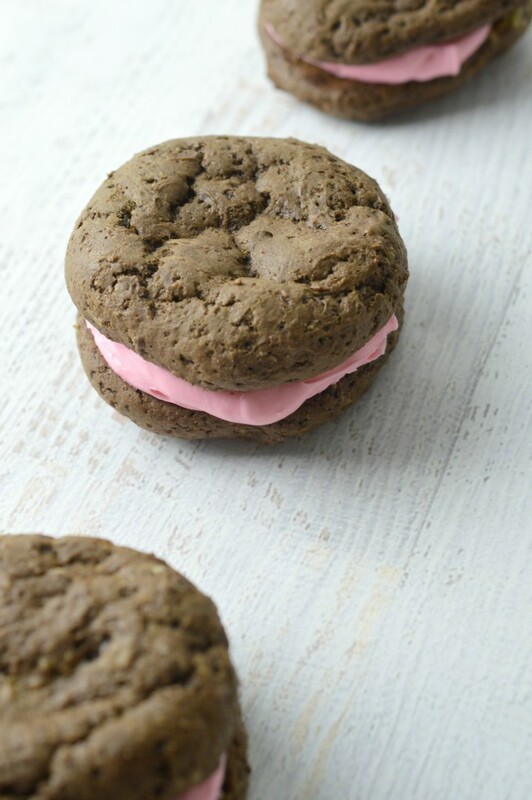 Ready for a terrific whoopie pie recipe? Ok, hold on … let’s set the scene first! It was 72 degrees here yesterday, despite the fact the rest of the country is still facing Snowmageddon. My kids almost wore shorts, but something told me it might not be in their best interest. By 10 o’clock the wind was howling and there was freezing rain everywhere. The house dipped down to about 65 degrees and I started to feel a chill deep down in my bones. My plans for the day shot thanks to chores and a sick dog who left me multiple spots to steam clean all over the house. By the time I picked my kids up in the afternoon, the day had pretty much been wasted. Or so it seemed. On days when nothing goes quite right and I feel like I just want to snuggle up close to all the ones I love, we bake. Today we tried making the whoopie pie recipe a friend shared with us. I didn’t have all the ingredients on hand to make her homemade frosting (shown here!) (made using strawberry milk mix, so clever!) so we used a store-bought whipped cream cheese frosting and added a bit of raspberry extract and pink food coloring (just a drop or two) instead, it was equally tasty I assure you! 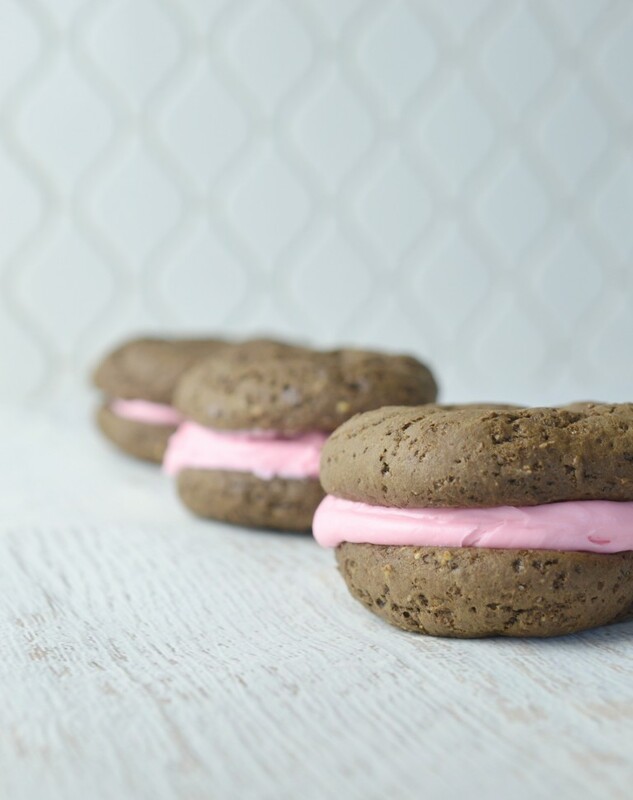 We’ve been working to collect more and more go-to cookie recipes and I’m excited to include this whoopie pie recipe in our regular rotation now. The whoopie pies are rich and indulgent enough to eat on their own but the slathering of icing in the middle just makes me feel like a fat kid who loves cake. Oh wait … I am. Haha, anyway these would be terrific to make for a class birthday party, special Valentine’s treat, party sweet, bake sale item, baby shower deliciousness or for any other time at all. I’m pretty sure they’d bake up great as cupcakes as well (at least the gluten-free version of the recipe I made — I will share that recipe soon! My current recipe plugin isn’t letting me create more than one recipe at a time so I’m going to have to look for a new one and update this post!) and if yours end up a bit flatter than mine (helps to let the batter rest and thicken for a bit) just make mini cakes instead! 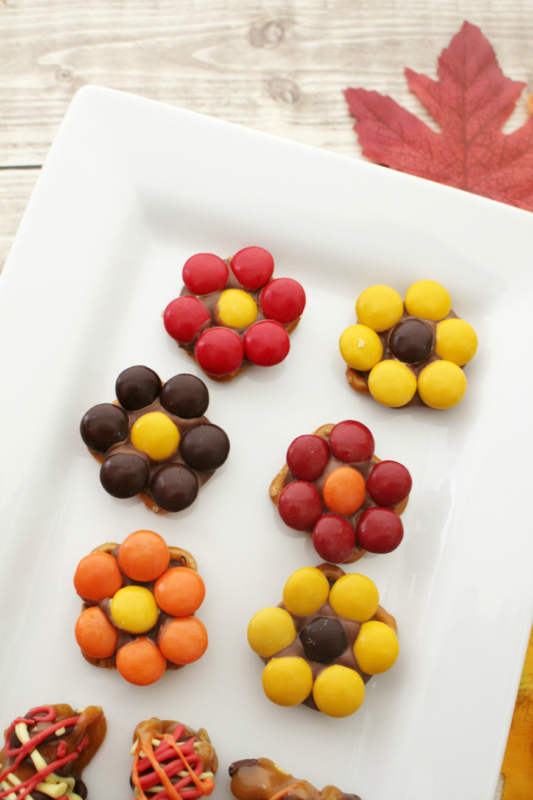 Layer them like stack of pancakes with a great big smear of icing in between each one. That would make for a fabulous mini birthday cake actually … perfect for a cake smash or “baby’s first birthday” style cake. Combine flour, cocoa powder, baking soda and salt and whisk till well blended. In a separate bowl, mix together the egg, sugar, butter, vanilla and milk. Add the wet ingredients to the dry ingredients and stir until you create a nice batter. Let sit for 5 mins for flavors to combine and batter to set. 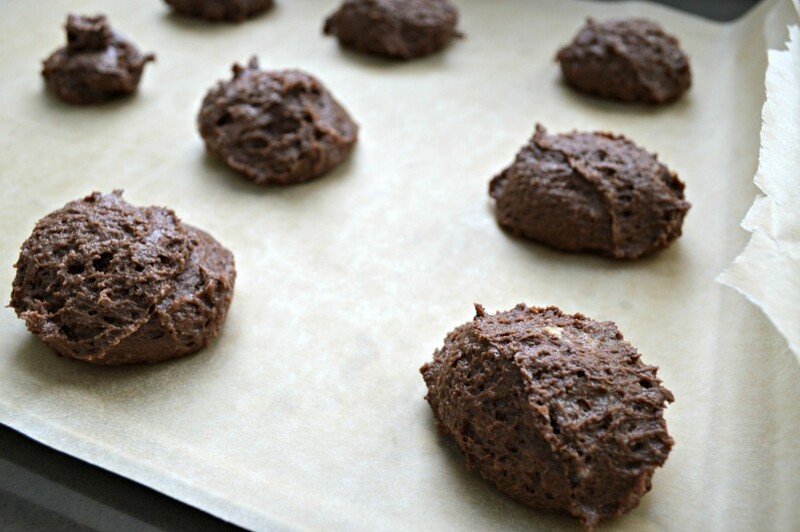 Use a small scoop or cookie dropper to scoop the batter onto a greased or parchment paper covered cookie sheet. You should be able to make 16 patties with the dough (that will make a total of 8 whoopie pies). Bake at 350 degrees for about 12 to 15 minutes. Let the pies cool completely before frosting. 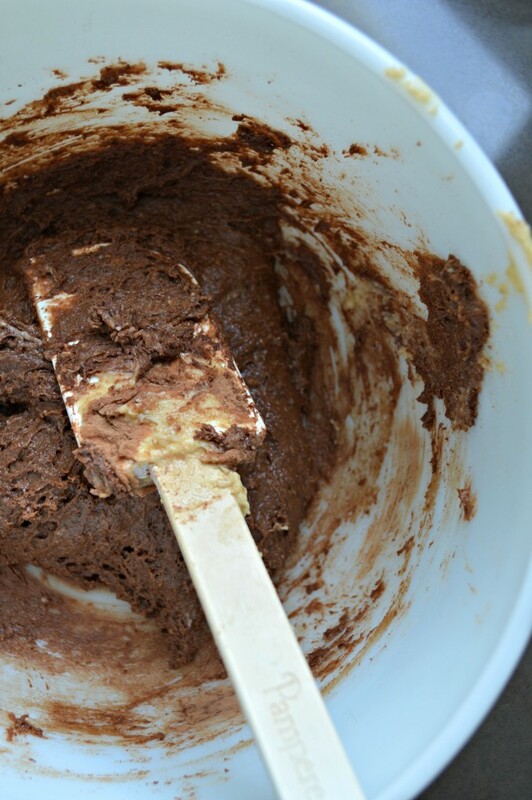 Mix all of the frosting ingredients together well or whip together with an electric hand mixer. Place a large dollop of frosting into the middle of one of the whoopie pie patties and top with another patty. 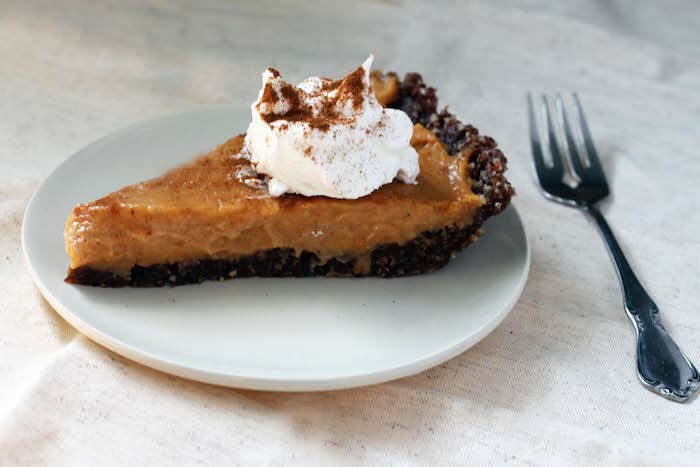 Enjoy immediately or store in the fridge until ready to eat. 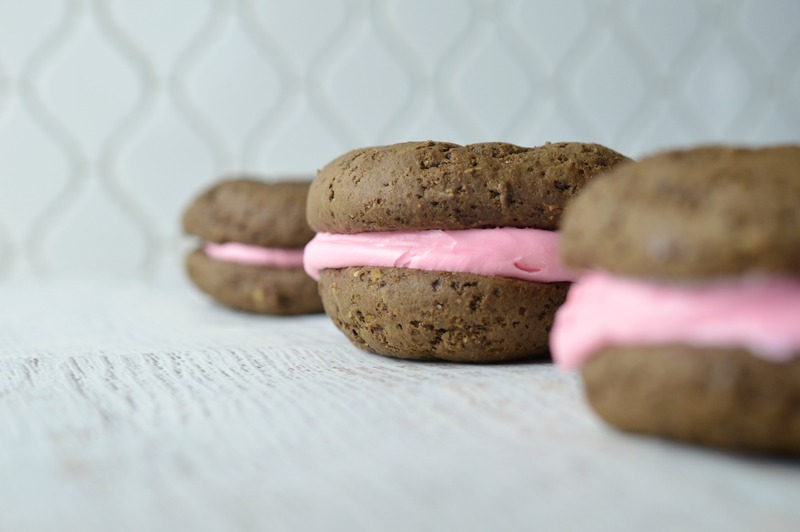 If you try this whoopie pie recipe, please let us know what you think! And if you get the inkling to share somewhere, tag them #KSWrecipes so we can find them and dote on your awesome baking skills! Note: depending on what brand of cocoa powder you use yours may end up MUCH darker. I tried a batch of whoopie pies using some ghirardelli cocoa powder I had at home and mine came out looking (and tasting) like devil’s food cake … which is fine by me!